The sun was hot in the cloudless sky as we pointed ourselves in the direction of the Clock Tower Gate in old Cartagena, three blocks from our hotel. Street vendors were beginning to unpack their stores and prepare for a day of business. Busses with protesting brakes screeched to a stop to allow people to make their way to work. A new day in an old place was underway. The Spanish Colonial Architecture, with its never-ending arches is usually beautifully detailed and a bit mysterious. The high walls with oversized doors on the front of buildings might hide the interior of a house or an empty space being used as a parking lot or outdoor work area. Elaborate street art on the exterior of buildings appears from time to time, dressing up the aging patina of old stone and concrete. Most old Colonials have a huge set of front doors, large enough to permit a horse and carriage to be driven into the interior of the building. Walls typically follow the exterior perimeter of the property line, often allowing for an open area courtyard in the center of the building. In this part of the world, second floor balconies, hanging out over the street are commonly adorned with oversized flowering plants providing a riotous display of color. 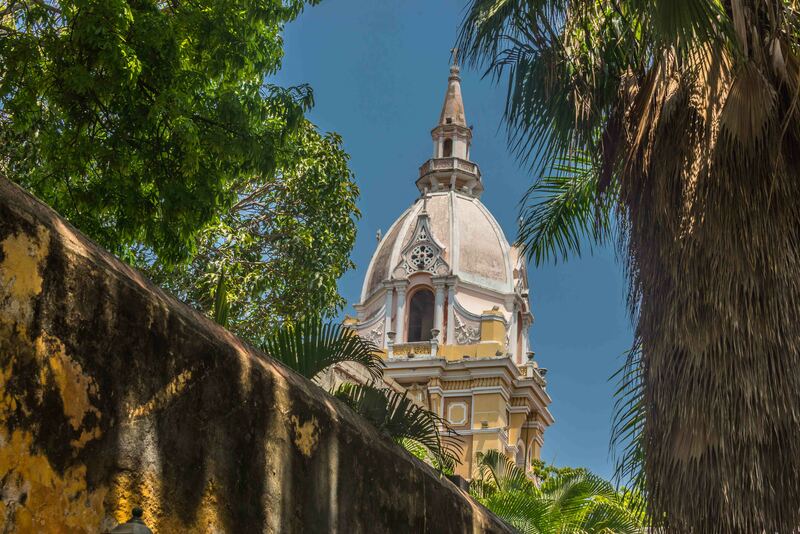 Wandering Cartagena is a leisurely and thought-provoking activity. 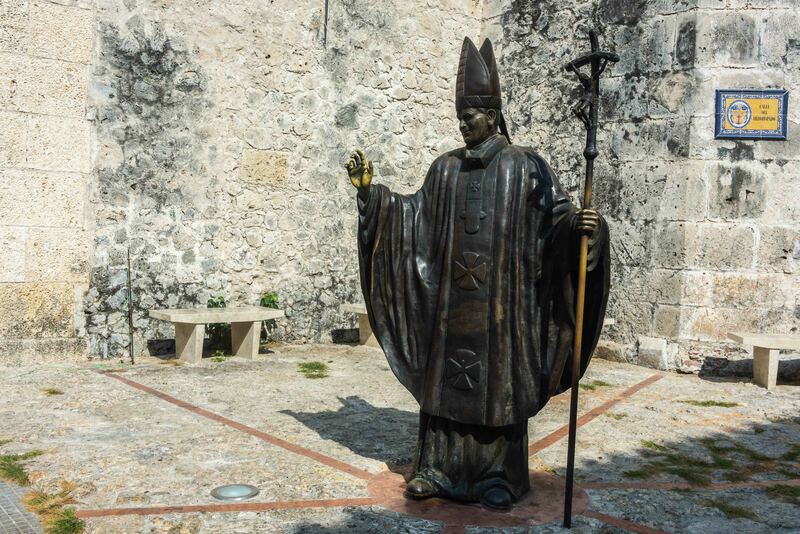 The place is full of statues, art, hotels, restaurants, and specialty stores, all nicely integrated into the ancient landscape of narrow cobblestone streets and colorful buildings. Every street corner provides a new vista to absorb. 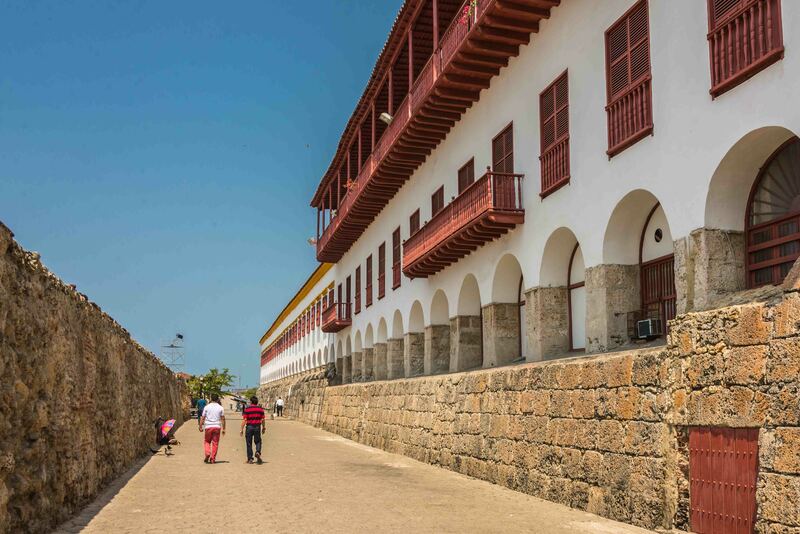 Large and small squares, historical churches and government buildings, ramparts of the remaining walls, and museums all come together with the occasional view of the adjacent ocean thrown in for good measure. All of this is provided in a vibrant, busy and functioning city that is devoid of heavy traffic and modern structures. You can stand anywhere, close your eyes and feel the history! 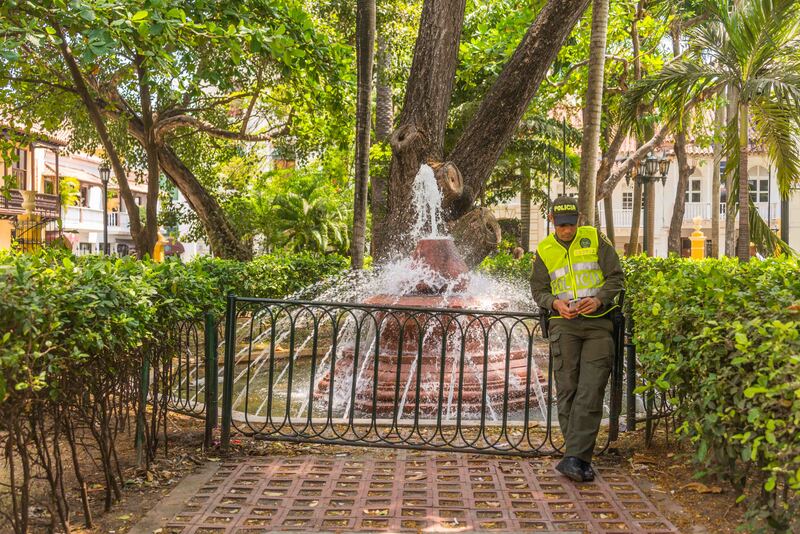 The scale of the squares is “Grande” and they often house large bronze statues of historical people. One square sports a number of sheet metal renditions of people at work. 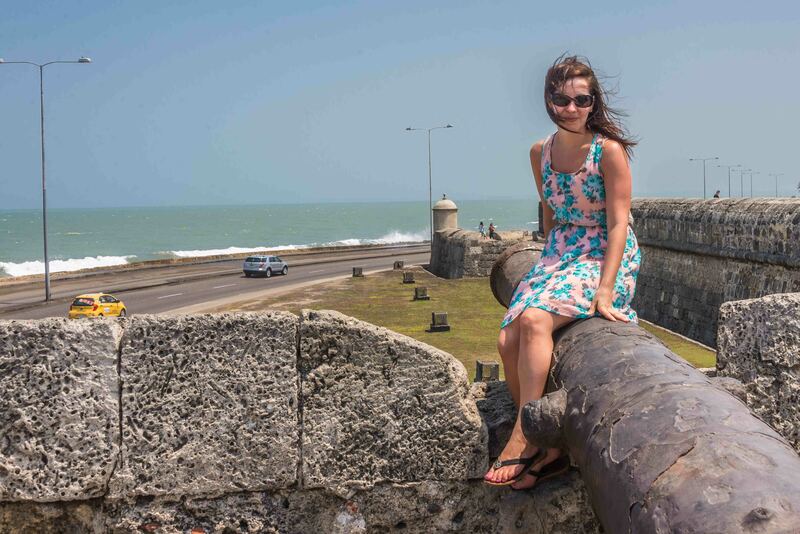 The city walls contain old cannons that integrate well into photographs, even with the wind. We stopped to take in the Palace of the Inquisition, a museum about torture and the atrocities carried out by the Catholic Church in an attempt to extort money from citizens by getting them to admit they were witches. The place is full of gruesome devices that, I am sure, produced the desired results. They even had an actual guillotine on display, which we were assured, was never actually used. The place was so hated by the local citizenry that it was burned to the ground within a week of the Church officially stopping its witch hunting. Nevertheless, this place produces one of the most beautiful views of the steeple of one of the old churches from one of the exterior courtyards. We found a small specialty coffee store that sells coffee from a private Columbian plantation under the name of San Alberto Coffee. Their testing is so stringent that they end up only putting the San Alberto name on about 25% of their production, while the other 75% is sold into the open coffee market. This coffee is some of the smoothest coffee I have ever tried. Too bad it is not obtainable in Canada. Tomorrow we move on to Santa Marta, a coastal town known to be the burial place for Simon Bolivar. In case you did not know, Bolivar was a Venezuelan statesman and military leader. Widely regarded as one of the most influential figures during the Latin American Wars of Independence of the early nineteenth century, he led Venezuela, Colombia (including Panama, at the time), Ecuador, Peru, and Bolivia to independence from the Spanish Empire, dramatically changing the political landscape of South America for the next two centuries. I have absolutely no idea of what to expect!